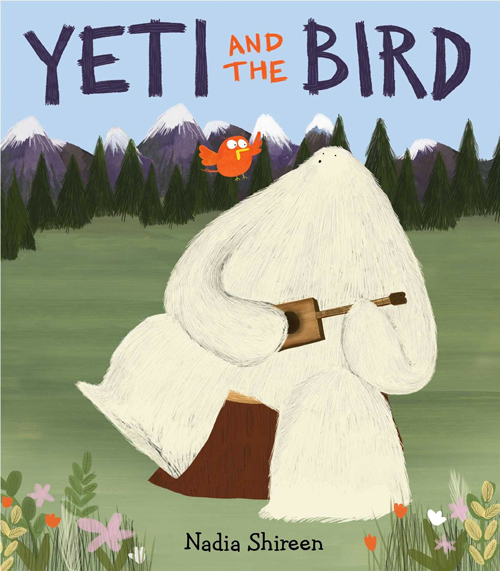 There is so much to love about YETI AND THE BIRD by Nadia Shireen (Atheneum). I am a sucker for friendship books. Friends found, friends discovered, and friendships of the unlikely. This book seems to have them all. I am also a sucker for cryptozoological stories. 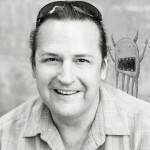 About sasquatch or Nessie or mermaids. (I still haven’t found a good one on chupacabras yet. Hmmmm….) Despite his perceived fearsome reputation, Yeti is a most endearing creature. Shireen has created a likable beast with unpredicted talents and you can’t help but fall for his charm. He lives in a world of a limited, desaturated, but very comfortable palette. The illustrations of his environment are inviting, both day and night. But in particular, early in the book when Yeti is contemplating his loneliness and his image is reflected in a pool. Man, I want to create a moving image like that someday. The other animals in the forest are charming in their own right and maybe they all deserve their own stories too. But I’ve got to give a shout out specifically to the rabbits (because BUNNIES!!!) in the spread where Yeti carries the tired Bird home. This is a simple but lovely book. Perhaps a little predictable and that is okay. It delivers. And the art is worth it alone. If this was published as is, as a wordless book, it would still stand strong. 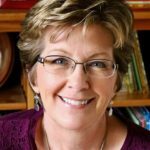 Scratching a Story— BOOK GIVE-AWAY! Those Fascinating Facts: Keep or Cut? I looked for this title at our public library’s catalog. I didn’t find it but I did find another by this author/illustrator. I will check it out. Maybe I’ll find the other later. I could put in a request for purchase. Perhaps the library would add it. Thanks for the recommendation. I love a good friendship book too. This is the only book of Shireen’s I’ve read so far but will search out others soon! 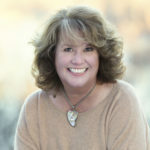 LOVE the Yeti–so cute! Will be checking this one out, Kevan. Have your heard of the Boston Yeti? That was pretty hilarious. I have not, Maria—I’ll google it! I’m going to buy this book because I can’t control my compulsion to purchase fabulous picture books! Need to get this one, because guess what? 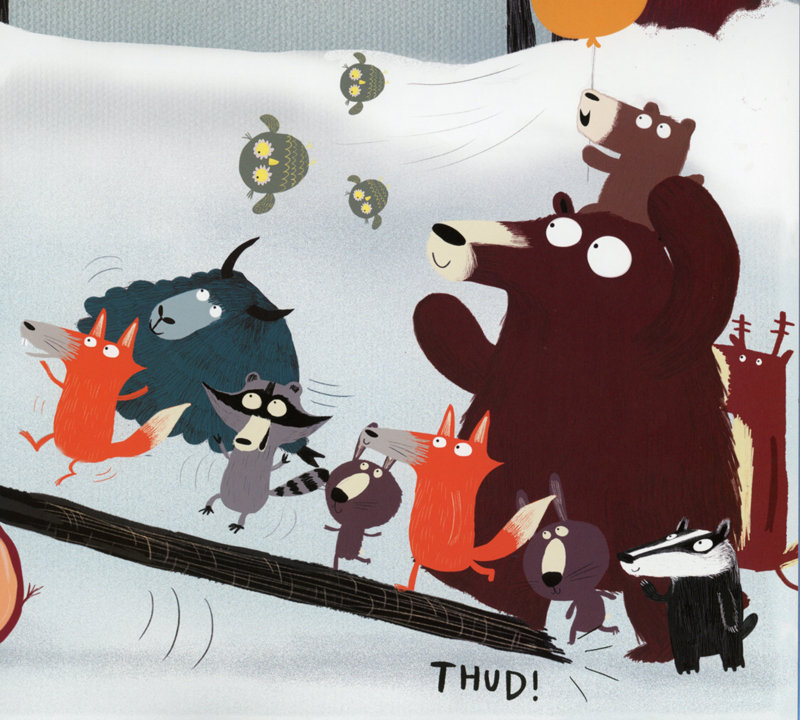 My next pb features a lonely bigfoot, too…trying to make friends with birds. Very different from this story, of course. Whew. Off to pick up this one at the library! Stories about unlikely friendships always get me “hook, line and sinker”. Thanks for the post! Awww. (I did that just from your description!) This looks like a real charmer, and I love the artwork. Adding it to the list . . .
I’m a terrible editor and I originally misspelled “cryptozoological” both in the title and the text. For those who noticed, it is now correct. For those who didn’t notice, there’s nothing here, go on your way. Wait till you see it in context, Linda. Ooh, I have this one waiting in a pile on the floor next to my desk. Maybe I will move it up to the top. Okay, now I have to find this book because I want to know what the Yeti’s surprise is. 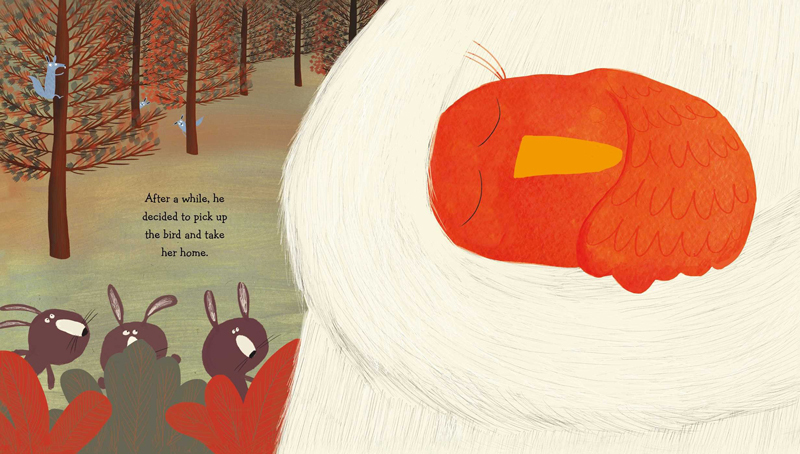 I just adore that image of the red bird nestled into the Yeti’s detailed fur! Lovely, Kevan, thank you so much!